Frankenwatches describe the practice of taking parts from different watches of the same calibre series and ‘creating’ a new or better pedigree of movement. In some countries of Europe they are called ‘Wedding’ watches. This practice is especially prevalent in the 500 series Constellations, where parts from Omega Geneve, DeVille and Seamaster 500 series calibres are used. In tandem with the obvious deception of Frankenwatches, there are a number of other intentional and inadvertent frauds that occur with Omega Constellations. 1. Housing a non-certified movement under a genuine or re-dialed Constellation dial. This is easily picked up by examination of the movement. The movements will have a different calibre number than those that powered the constellation (354, 501, 504, 505, 551, 561, 564) and will have, though not always the case, no mention on the automatic winding mechanism, the rotor (In some earlier calibres), or bridges to “Adjusted to (5) positions and temperatures” Beware of Constellations with ‘monocoque’ (Unicases) when the movement is accessible only by removal of the crystal. Often, fraudsters will claim they can’t open the case but promise the movement is a Constellation. 2. Using a non Constellation 500 series movement and replacing the rotor bridge with a genuine Constellation part which reads “Adjusted to (5) positions and temperatures” and the number of jewels (in Cal. 551 for example, “Twenty-Four Jewels”) This can be often detected by the difference in coloration of the new part to the rest of the watch, as shown in the picture above. 3. Using a 500 series movement made for a Seamaster and replacing the train bridge with a Constellation calibre bridge (as shown in the picture) Again colouration contrasts or newness of the bridge demands caution. 4. Placing a Constellation dial and movement in a Seamaster or Geneve case. This is easily identified, as case numbers won’t match up with calibre numbers on the official Omega database. 5. Replacing worn hands and crowns with non-genuine Omega hands and crowns and claiming the watch is 100 percent authentic. A common problem with Omega Constellations is the replacement of worn hands with incorrect dauphine hands and centre sweeps. The hands on authentic Pie Pans extend only marginally into the printed minute index and do not overreach. 6. Badly executed dials and re-dials. Ask for super-sized pictures so you can examine the quality of the printing and also the placement of lettering. The words Omega, Automatic, Chronometer, Officially Certified appear in descending scale underneath a gold Omega symbol on many of the earlier Constellations, while in later Constellations the bulk of the identification appears near the six o’clock marker. Also, note if the star near the six o’clock marker has one of its points bearing directly towards the twelve o’clock marker. In some cases, vendors who claim originality of the dial can be exposed by the points of the star bearing in directions other than twelve o’clock. 7. Replacing numerous worn parts in a genuine Constellation with genuine parts. While this is a perfectly acceptable practice, it does indicate that at some stage in the life of the movement it was neglected or damaged. Knowledgeable and pernickety collectors look for signs of colour variation on the movement and often avoid watches that are not of one colour hue. 8. Claiming an old warrior is a handsome prince. Many vendors use descriptions like ‘minty’, ‘100% authentic’, ‘very clean’, ‘this one is a keeper’, and so on. Most of these descriptions are useless if not backed up by evidence. When examining a good quality picture of the watch movement, and always ask for pictures for the more collectible 300, 500, 700 and 1000 series if you are buying on the internet, look for any discolouration of the surfaces of plates and bridges. Look for any signs of corrosion or parts of the watch that do not match in colour, particularly rotor bridges and the train bridge that contains the calibre and serial numbers. Look for new additions that show themselves by their shininess. These are all indicators of inauthenticity, parts swapping or at least major repairs. 9. Examine the movement for burred screw heads and scrapes and damage to the movement plates or bridges, which are sure signs of inexpert work, or at least indicate the movement was separate from the case for some time before a case was found to match. Checks for surface discoloration on the movement plates, blotches, corrosion, or parts that don’t match the rest of the movement patina. Look for scratches or gouges on the non-replaced parts, and look for corrosion on the visible stainless steel parts of the movement, such as the regulator on the balance and the crown and ratchet wheels. Take particular notice of the rotor. Look carefully for any signs that the rotor post (pinion) has worn. For example, look at the bottom plate of the watch around which the rotor swings - any sign of scuffing? Look at the rotor itself for signs that the copper/berrylium coating has worn at the edge, indicating that it may have scuffed the case back. Inspect the case back for any signs of scuffing. A worn rotor post can indicate infrequent servicing and possible wear of other movement parts. 10. Examine the case back for wear to the Constellation medallion to determine whether the watch has had a hard life. Beware of excessive polishing that takes the sharpness away from the Constellation medallion, as that again indicates considerable wear and tear overall and devalues the watch. In particular, make sure the case and case back have some semblance of gloss finish and not an inauthentic matt surface. Examine the case for sharpness, particularly of the bezel and lug edges. Watches that have experienced a lot of wrist time or that have been worn inappropriately will show rounded lugs and indistinct chamfer of the bezel. 11. A watch that has obviously had a hard life indicates carelessness towards its maintenance and irregularity in servicing. Generally speaking, Omega Constellations should be serviced every three to five years, and it is not difficult to detect a watch that has been neglected because the signs of neglect are obvious to the naked eye. Badly discoloured watches with scratches, gouges to the movement, highly polished case backs and inexpertly refinished dials are sure signs of the amateur watchmaker at work and should be avoided. They can also point to a tired old movement jazzed up for sale and marketed with great hyperbole to the unwary Internet shopper. 12. Look carefully at the dial to see if screws have caused minor or major indentations on the dial. This indicates that incorrect or inauthentic screws have been used in the movement. Look for corrosion on the dial or flakes that have come off the dial. This can indicate that a watch has spent some or all of its life in the tropics and was not serviced as regularly as it should have been. It can also indicate immersion in water. Constellations that are regularly serviced will have their seals replaced at service and should show few signs of moisture having entered the case. Remember rust under a dial cannot be seen and flaky dials can be a sign of hidden problems underneath. 13. Rust cannot generally be removed from watches and at best can be neutralised. A sure sign of neglect is corrosion on or near the threads of the case back or the area where the case back meets the case. These are signs of irregular servicing and signify the possibility of excessive wear of the movement. Rather than avoiding watches that do have one or some of the above signs, use your knowledge to better determine the value of the watch. 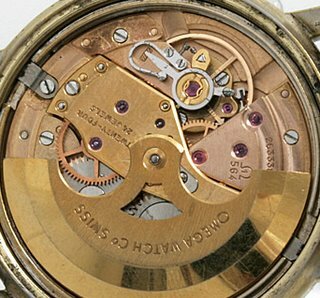 An evenly coloured movement, retaining much of its original sheen and showing signs of regular service should demand a higher price than a poor cousin that has been through the wars. This is a great site and goes to show I know nothing about watches, which leads me to my dillema. I live in the Philippines and was given a watch by my grandfather an Omega Constellation. Long story short I need to know if it's real and how much it's worth. Been to a few Omega stores here but no one seems to know what's up. They say the battery harness is broken and for further fixing it has to be sent to Switzerland which will cost an arm and a leg. Of course I wanted to keep it in the family but looking for advice as to what to do with it. Hoping to hear from you. Pleae email if you can. I'm quite new to watch collecting and have found your articles very helpful. At the same time, there's so much information that it's a bit overwhelming. In any event, I currently own a 1960s Geneve that I purchased from a jeweler, and, as far as I know, it meets or at least very closely approximates factory specifications. Now, though, I am hoping to acquire a 1960s stainless steel Constellation Pie Pan. I do not feel as though I know enough to try to source one on Ebay or anywhere else online. And so I've been dealing with local jewelers. I'd like to find a Constellation that meets the criteria for factory specification you outline in your piece, "Acquiring a Factory Original Omega Constellation--Is it an Achievable Dream." Should I expect this to be difficult even though I'm dealing with well known local jewelers as opposed to online sellers? But the same advice applies, and that is, that a seller is only as good as the watch theyre selling now. So we must arm ourselves with enough knowledge to ensure that we can make a judicious choice. Once having made your own appraisal on a watch that youre keen on, click the bout me on this site and send me your appraisal and I'll review it for you and pass some comments. That way you get to choose a good example and build your knowledge. Not sure if my original comment went through, but I have purchased a late 50s early 60s Constellation pie pan from a "reputable" watchmaker but having read all this incredible technical info am a little concerned that its condition is almost too good to be true. I don't actually mind if it's had a bit of restoration...but not sure how to authenticate it. Graeme, send me some pics and I'll have a look at it. Need to see dial, movement and caseback. Click on 'About Me' and go through to the email link. Thank you, Desmond, for this clear and focused plan of action. First of all THANK-YOU SO MUCH for sharing your great knowledge about these fantastic timekeepers. I am 27 years old and I have been so much in love with these Omega Constellation that finally, after 3 years of research and savings, I have finally purchased my first Connie! I am now a owner of a Constellation Pie Pan "Deluxe" 18Kt Cal no. 551, case no. 14381/2 SC-3, Serial no. 17.001.842. I would like to know from you if everything sounds right since I could not find much info regarding the Serial no. Thank-you so much in advance! I too fell in love with a "Connie" and purchased it a little to impulsively (perhaps) from a dealer that a collector said was definitely reputable. Now I have come across your amazing site, I am starting to worry a bit...mainly because my watch (or the dial at least) looks unusually new...despite being supposedly late 1950s. It has cross hairs, but v. accurately done and the star is lined up beautifully. The logo also seems v. good, but the whole appearance is a little shiny. So I am either v lucky to have found a watch in an excellent condition or it's been partly restored (hopefully not an entire fake!) If I send pics, would anyone more expert like to comment? If a gold omega constellaction finish has been replated by a jeweller, what does this do to the value? The answer is yes, the value is substantially affected, because re-plating indicates loss of originality. Chances are if the thick, 220 micron gold has worn, the shape of the lugs will be rounded. No dedicated collector would probably buy such a watch.